Horizon Gymnastics & Dance Academy is a strong believer of the Positive Coaching Alliance. We strive to follow their ideals and teach with the focus of developing the athlete as a person and create success from within first. Horizon is a year round program offering classes and competitive team all year long. Our Summer Schedule begins as of June 3, 2019. Congratulations to Level 9 gymnast, Hayley Gabbard for Qualifying and competing in the USA Gymnastics Level 9-10 Regional Championships. This outstanding accomplishment has come from lots of hard work and Hayley is honored to be the only gymnast in our area to be represented at Regionals. Horizon could not be more proud of this young athlete! Hayley did an excellent job in Cartersville, GA among the best gymnasts in the Southeastern part of the USA! We want to congratulate Hayley and her Coaches on this outstanding accomplishment. WHY GYMNASTICS IS GREAT FOR YOUNG KIDS...HERE'S SIX GREAT REASONS! 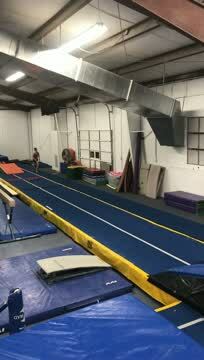 What: Gymnastics group warm up will be followed by basic gymnastics instruction on floor exercise. Children will then have time for free play on balance beams, tumbletrack, uneven bars, foam pit and bounce house. We will gather at the last part of the class for a fun group activity and parachute time. This is a great introduction to the sport of gymnastics and offers social interaction, physical development and coordination. For more information on this or any Horizon Gymnastics & Dance Academy program please contact us. Our Ninja Gymnastics program has been very successful and we are now excited to announce our list of NEW classes for Spring 2018. The Horizon Ninja Gymnastics Class combines all the basics of tumbling, trampoline and gymnastics while focusing on developing personal fitness goals using cross fit, plyometric stations, rope climbing and obstacle courses. Ninja Gymnastics Class will keep your child moving! This is a great class for athletes who want to cross-train for other sports and improve their strength, flexibility, agility, and coordination. Fitness-Experiencing fun associated with fitness activities can create life-long positive fitness habits. Mental Focus-Learning how to concentrate on task and achieving goals. Balance-Gymnastics like balancing skills can transfer later to riding a bike. Social Skills-Taking turns, working with partners, sharing, making friends and acknowledging the accomplishments of others. Strength-climbing on the bars and ropes develops muscle strength. Flexibility-Improved range of motion throughout stretching and holding body positions. Coordination-Hand-eye coordination improves writing ability while eye-tracking improves reading readiness. Burn Calories-Help jumpstart a life of fitness. The Sport of ALL Sports-Gymnastics Ninja Classes prepare kids for ALL Sport! "2018 Best of Port Charlotte Award". We are so happy to be awarded into the "Business Hall of Fame" for winning this award three years in a row! Each year, in and around the Port Charlotte area, the Port Charlotte Award Program chooses only the best local businesses. Focusing on companies that have demonstrated their ability to grow their business a provide outstanding service to the community. Horizon Gymnastics & Dance Academy has been selected within their field of expertise and exemplifies the best of small business for 2018. My Two children have been team members at Horizon Gymnastics since 2012. Practices are consistent the athletes stay busy learning new skills while having fun! Horizon's coaches have been there for my young athletes, pushing them to set and achieve goals, while rejoicing along side them as they succeed. Horizon has truly become a second family. We couldn't be happier with our initial decision enrolling our children at Horizon Gymnastics!! "Callie started your Tumble Tots class last month and LOVES it. I had caught this picture of pure joy on Callies face because she "finally did the flip and didn't let go of the rings". Miss Charlotte is amazing! Thank you! "